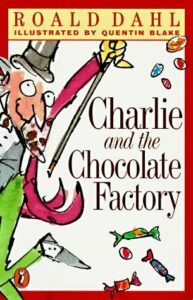 Charlie and the Chocolate Factory is one of those books that was incredibly important in my formative years. My parents are both former schoolteachers, and firm believers in the importance of reading aloud to kids. Charlie and the Chocolate Factory is my dad’s favorite kids’ book, so it stands to reason that this was one of the many books he chose to read to me when I was little. As an adult I have realized that it is not just the books I read as a child, but those that were read aloud to me when I was little, that mean the most to me. They are the ones I have the strongest memories of and the ones that can evoke the strongest emotions. I never read My Side of the Mountain or Hatchet, but my 3rd grade teacher read them aloud to us, and I’ll never forget them. The Narnia books, the Lord of the Rings trilogy, the Ramona books, all the Roald Dahl books–my parents read them all to me, plus countless others, and these are the books that I remember most fondly. There is nothing better than sharing a story with someone. It was not unusual in my house to be reading a book and find certain passages were bracketed or had notes in the margin–my dad read aloud to all his classes, and would use these notes to guide his reading. When I read these books now as an adult, it’s not my own voice in my head that is narrating, but my parents. This add an extra element of pleasure to rereading childhood favorites. And truly, Charlie and the Chocolate Factory has to be a favorite. The story of poor little Charlie Bucket and the Golden Ticket is one of the most magical and satisfying stories there is. The plot is well-known, of course–Willy Wonka, the secretive chocolate maker, has released five Golden Tickets, hidden in five chocolate bars, that will allow five lucky children to get a behind-the-scenes tour of his factory and a lifetime supply of chocolate. Poor Charlie, always on the verge of starving to death after his father loses his job at the toothpaste factory, is the lucky finder of the final Golden Ticket. Accompanied by his Grandpa Joe, he embarks on a fantastic adventure in a place that every kid dreams of: a chocolate factory. The other four children, are, of course, dreadful little creatures. Greedy Augustus Gloop, spoiled Veruca Salt, obnoxious Violet Beauregard, and lazy Mike Teavee represent the worst qualities in children, and all meet dreadful ends, while sweet little Charlie perseveres to an absolutely perfect happy ending. What a satisfying tale. Love love love this book, for many of the same reasons as you mention. I absolutely remember my mom reading it to me, and have read it to my own kids, hoping they’ll have a similar fond memory of it someday. The one book that stands out to me was my mom reading Dahl’s Danny the Champion of the World. Not his most popular or his zaniest, but I will always remember her telling me about the gypsy caravan and the pheasant poaching. Can’t go wrong with Dahl. You really can’t go wrong with Dahl. The one I remember best is Fantastic Mr. Fox. My dad would do all the voices. I’m making a list of childhood books to re-read. This one is definitely on the list as is The Phantom Tollbooth, Mrs. Frisby and the Rats of NIMH, and at least something by Edward Eager. Edward Eager!!! Happy sigh. I loved all those books, but Half Magic was my favorite. This is exactly why I read this again. I also recently picked up The 21 Balloons and Peppermints in the Parlor. It has been so fun to go back and read some of my old favorites. This made me tear up. I still have quite a few picture books memorized from my days reading to you kids. Treasured memories and so nice to hear that you also treasure it.